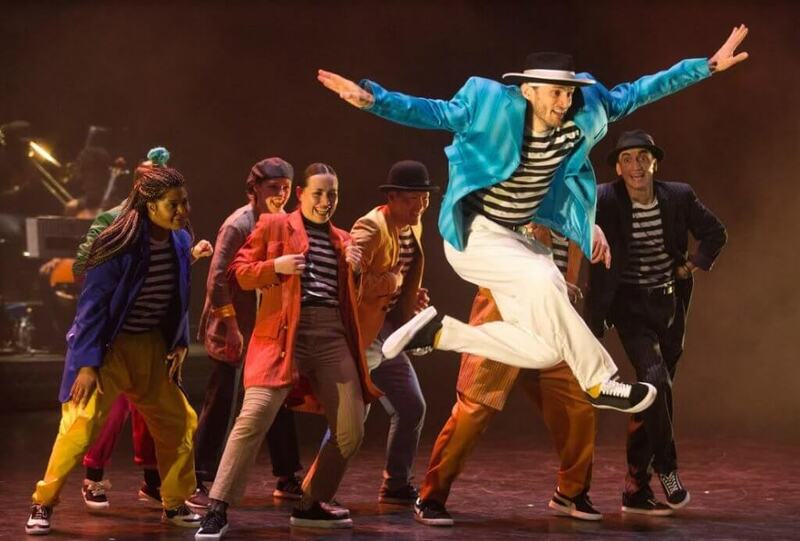 I was asked if I’d share a few words ahead of this year’s Break­in’ Con­ven­tion; an Inter­na­tion­al fest­ival of Hip Hop dance theatre at Sadler’s Wells Theatre. I’m Ben Ajose-Cut­ting (Mr.Ben), artist­ic dir­ect­or, cho­reo­grapher and dan­cer for The Lock­smiths dance co. I remem­ber sit­ting in Sadler’s Wells Theatre at the very first Break­in’ Con­ven­tion back in 2004. I wit­nessed a back to back onslaught of mind-blow­ing skills and artistry delivered by a mul­ti­tude of dan­cers, com­pan­ies and pion­eer­ing legends such as The Elec­tric Boo­ga­loos who hadn’t returned to Lon­don since the 80’s. It was a his­tor­ic­al land­mark and the begin­ning of some­thing that would go on to impact the UK and glob­al dance scenes forever. Sud­denly this pres­ti­gi­ous plat­form in Lon­don more com­monly known for clas­sic­al and con­tem­por­ary dance was host­ing Hip Hop dance from, to quote Break­in’ Con­ven­tion, ‘around the world and around the corner’. It was inspir­ing. If they weren’t already, Hip Hop dance artists began push­ing their craft in new ways and fur­ther explor­ing the pos­sib­il­it­ies of cre­at­ing the­at­ric­al Hip Hop. Return­ing to watch each year what artist­ic dir­ect­or Jonzi D and the team had cur­ated demon­strated the con­tin­ued devel­op­ment and growth of Hip hop dance theatre. I remem­ber the atmo­sphere sit­ting among a cap­tiv­ated audi­ence watch­ing Frank II Louise per­form Drop It in 2006 and feel­ing like I’d been trans­por­ted to 2026! As iron sharpens iron, the wealth of artists that have hit the Break­in’ Con­ven­tion stage over the past 15 fest­ivals have not only sharpened each oth­er, they have also inspired next gen­er­a­tions. I’m hugely grate­ful for what Jonzi D and the whole Break­in’ Con­ven­tion team have done over the years in estab­lish­ing this plat­form togeth­er with the pro­fes­sion­al devel­op­ment and edu­ca­tion­al pro­grammes. It’s hard to ima­gine Hip Hop theatre would be where it is today without it. 6 years on from the first Break­in’ Con­ven­tion I had per­formed there twice, one of which was in a trib­ute to Greg Campel­lock Jr, RIP, first gen­er­a­tion Soul Train dan­cer and ori­gin­al mem­ber of the group respons­ible for pion­eer­ing ‘street dance’ in 1970s; The Lock­ers. The piece cho­reo­graphed by Suga Pop of The Elec­tric Boo­ga­loos included some of us who had been Greg’s stu­dents and as well as Suga Pop, the piece fea­tured Pop­in Pete, Tony Gogo, Flo Mas­ter, Lock­adelic and Hilty & Bosch. It was an immense priv­ilege to be part of hon­our­ing Greg who was and is such an influ­en­tial dan­cer and whose leg­acy lives on. A fur­ther 6 years on, in 2016, I deb­uted my first work with my newly formed dance com­pany, The Lock­smiths — A Lon­don-based dance com­pany spe­cial­ising in the dance style Lock­ing; a dance style cre­ated by Don Camp­bell, ori­gin­at­ing from 1970s, and which you may have seen on Soul Train. Since then, The Lock­smiths have per­formed a new work at the fest­ival each year and last year I had the priv­ilege of col­lab­or­at­ing with Jazz re:freshed, Jason Yarde and a fif­teen-piece orches­tra. Cre­at­ing work to a fresh music score and per­form­ing with live music such as this was heav­enly! For me the idea of work­ing with live musi­cians makes a lot of sense and I’d like to see it hap­pen a lot more. For this year’s fest­ival I am cur­rently work­ing on a new piece that I am seek­ing fund­ing for to develop it to a longer work and edu­ca­tion­al pro­gram­me. The piece, ‘Music­al Chairs’, is a play­ful and funky inter­pret­a­tion of the clas­sic party game and explores the char­ac­ter­ist­ics of music­al instru­ments, how they work togeth­er and the phys­ic­al embod­i­ment of these ele­ments and their char­ac­ter­ful inter­ac­tion togeth­er. The music for the piece will be per­formed live by one musi­cian play­ing all of the instru­ments and using soft­ware to build and lay­er loops to cre­ate the whole sound score live! I hope you can make it!